In Addis Ababa, Ethiopia, what is commonly known as the “Korean hospital” is composed of a large compound with the hospital complex, some gardens, a parking area, and apartments for staff. The hospital complex has two wings. In one wing are in-patient rooms and surgery. In the other wing are out-patient services, a cafeteria, laboratory, administrative offices, and a chapel. A Presbyterian church in Korea established the hospital, with financial and professional help from doctors in America. Outside the hospital, the Korean, American, and Ethiopian flags flutter in the constant breeze. It is fast gaining a reputation as being one of the best hospitals, certainly in East Africa, and possibly in the whole continent. 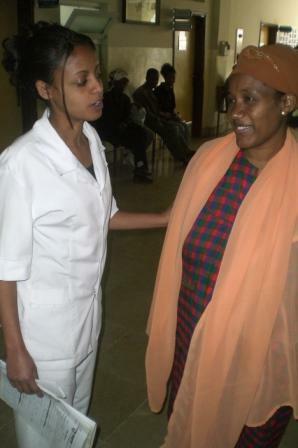 At least weekly Aberesh and I visited Dr. Mekonnen in the outpatient section of the complex. We got to know the routine quickly. We turned in our registration card, then waited. We were released to the “Blood pressure station,” then waited. We were released to the doctor’s office, then waited. We saw the doctor, returned to the payment window, returned to the doctor for our registration card, and then left for home. Many times Tessema (Aberesh’s cousin) would take us in his company car, but most times we rode the Blue Donkey. When riding the Donkey, it took us at least an hour each way. On one such day our appointment was for 2:00, so we arrived at 1:30 to get the preliminaries out of the way. We waited to see Dr. Mekonnen one hour, two hours, THREE hours! The waiting area was the giant hallway of this section of the hospital. All patients waited together in upright, stationary chairs. Sometimes I used this time to show those around us the Jesus Film or an Ethiopian worship video on my laptop. Sometimes we just made new friends and I tried to improve my Amharic. Sometimes we napped. But always our legs were down, swelling by the minute. And always, the chairs were hard, our hips and back bones aching. As the hours ticked by, Aberesh and I longed to walk, to get some fresh air, to be out of the bedlam. But we couldn’t leave the door of Dr. Mekonnen’s office. So we took turns – first her, then me – stretching our legs, but never wandering far from the office. Her attitude was insistent, her manner urgent. Without thinking, I blurted out, “No, I’m just a servant of the Lord Jesus!” Then I excused myself and continued to help Aberesh out the door. A servant of the Lord Jesus…. On the ride home I pondered the encounter. Why had that explanation leapt to my tongue? And yet, wasn’t it true? The older I get, the simpler life becomes. I don’t need all these classifications, all these minute dissections. A servant…that’s all I am. A servant of the Lord Jesus. What He says, I must obey; where He sends, I must go. I have no identity apart from Him. I have no purpose apart from Him. In fact, I’m a special kind of servant – I’m a slave servant. The apostle Paul arrived at this point. Being a slave servant of the Lord Jesus was his identity and life purpose. (What better “purpose-driven life” could there be?!) Look at his letter to the Philippians. His identity in 1:1: “Paul and Timothy, servants of Jesus Christ….” His purpose in 1:21: “For me to live is Christ.” And his ministry was largely pleading with others to adopt this perspective – a reasonable conclusion to any serious consideration of Calvary and the Master (see Rom. 12:1-2, Eph. 2:8-10, Col. 3:1-4). There is great joy and peace and freedom in being simply a slave servant of the Lord Jesus. Imagine having a Master who has given His all – His glory, His wealth, His life – for his slave servant. It is this Master whom I serve. “I’m just a servant of the Lord Jesus.” And in being just a servant, the message to the world isn’t cluttered with other designations. People are free to see the Master, and Him only! I’m just a servant of the Lord Jesus.